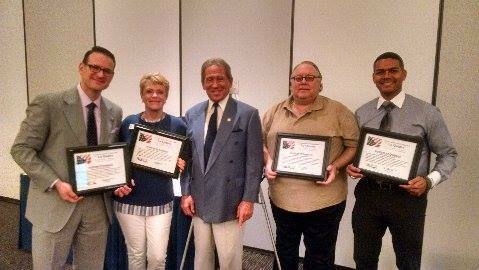 May 23, 2018 - Left to right: Steve Wolkowicz US Congress, Chairman Robert Sylk, Joseph Johnson LQ City Council, Paula Maietta LQ Mayor, County Sheriff Stan Sniff, Secretary of State Mark Meuser, and Doug Hasset US Congress. 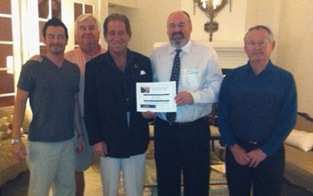 Those not in picture who had to leave after speaking were: Gary Jeandron and Andrew Kotyuk Assembly, Glenn Miller Indio Council and District Director for Senator Stone, Andy Colgan Congressman Ruiz's Campaign Manager, Dan Ball US Congress, and the prestigious Salton Sea Scientific Education and Research Committee with COD Professor Alan Hurt and Salton Sea Program Director Frank Ruiz, and as always the special Blessing by La Quinta Chabad Rabbi Katz. 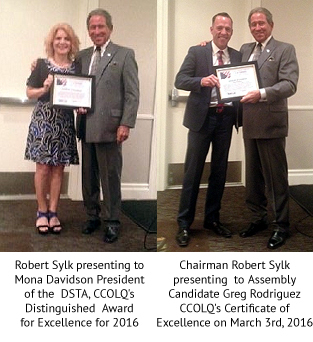 Chairman Robert Sylk presenting to Riverside County DA Mike Hestrin (on left), City Council Members Steve Sanchez (on right) & Kathleen Fitzpatrick and La Quinta City Commissioner Joseph Johnson CCOLQ's 2017 Distinguished Award for Excellence tonight 3/14/2017 with 135 in attendance. 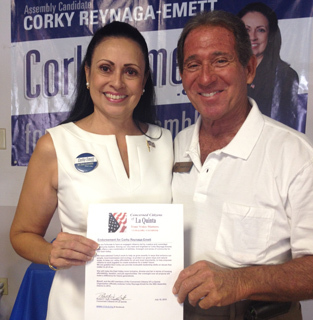 Many questions about on-going city irregularities and Prop 47. The meeting lasted from 5:45pm to 8:00pm. 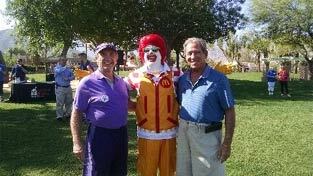 Check www.ccolq.org for next meetings. 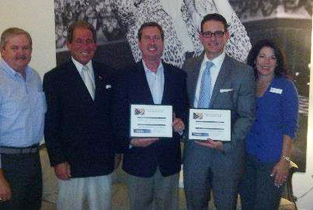 Riverside County DA Mike Hestrin with County Supervisor Manny Perez to his right and Robert Sylk to his left along with 18 other candidates (9 on either side) for Federal, State, County, and local La Quinta offices (US Senate, US Congress, County Sheriff, Attorney General, State Assembly, State Senate, Riverside County DA, with 200 in attendance. 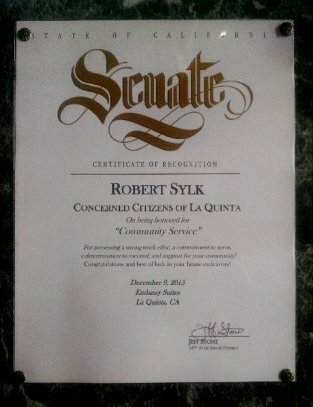 Concerned Citizens of La Quinta and Sylk received Awards from the State Senate, County Supervisor and Appreciation from the District Attorney (see below). 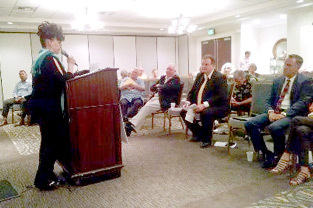 The evening went overtime as each candidate was allowed 5 minutes to speak and with Chairman Sylk's remarks followed by past Mayor Adolph, LQ Council members Fitzpatrick and Pena, the Pledge of Allegiance and Blessing from Chabad Rabbi Katz and then Q & A we adjourned at 8:15pm. A really great evening. Next one May 23rd. 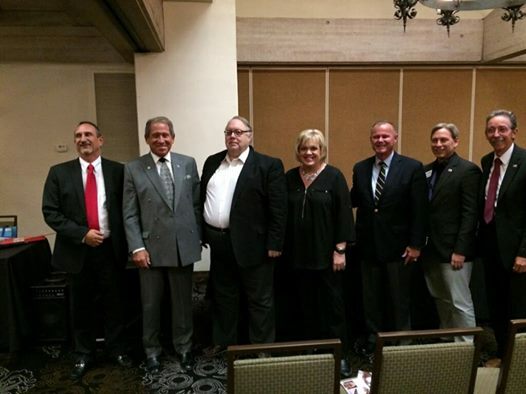 Sylk is sitting next to the two (2) County Sheriff's Candidates Dave Brown and Chad Bianco. 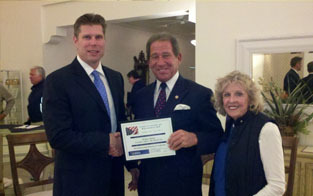 Eighty-five (85) attendees plus seven (7) candidates at The CCOLQ Candidates Forum shows Senator Jeff Stone giving the Opening Remarks. 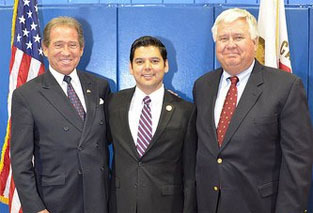 Assembly Candidate Greg Rodriguez and Chairman Robert Sylk also spoke eloquently. 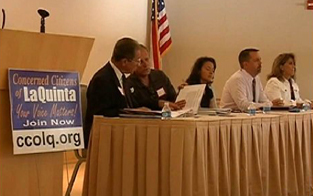 All seven (7) Candidates were grilled for 90 minutes and wore their bulletproof vests because of the toughness of the questions individualized for each candidate. Dear Councilmembers Kathleen Fitzpatrick, Steve Sanchez, and Commissioner Joseph Johnson; Please accept this special invitation to participate in our monthly meeting on Tuesday March 14, 2017. 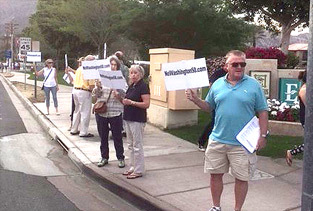 As you are well aware we are a group of professionals who have formed www.CCOLQ.org (Concerned Citizens Of La Quinta) because we are extremely concerned about La Quinta and the Coachella Valley's future. 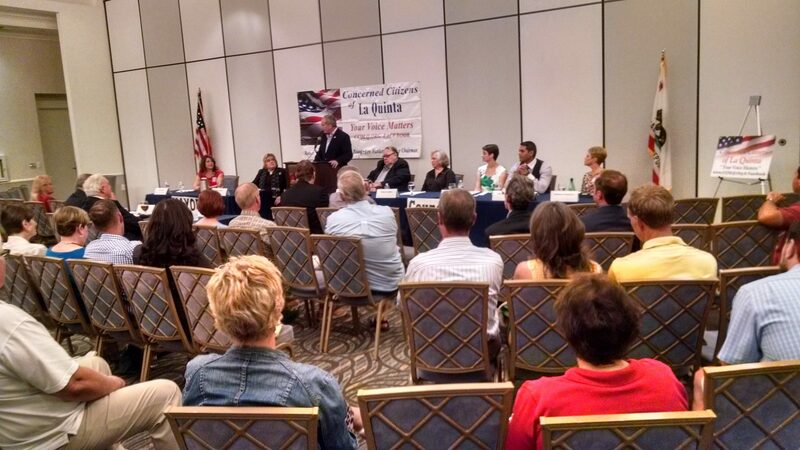 Robert's opening remarks October 12th, 2016 at CCOLQ Candidates Forum. Discussion Group #1 of 2 (28 attending). 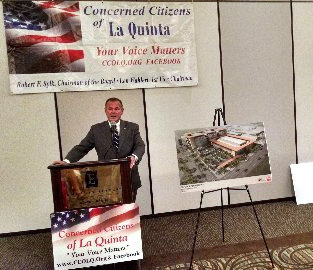 Much was accomplished due to the involvement of our Congressman and a report on those issues affecting La Quinta will be announced publicly thru CCOLQ channels only. 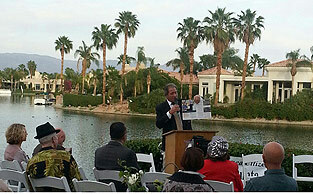 Unfortunately, The City of La Quinta did not attend and missed another great opportunity. 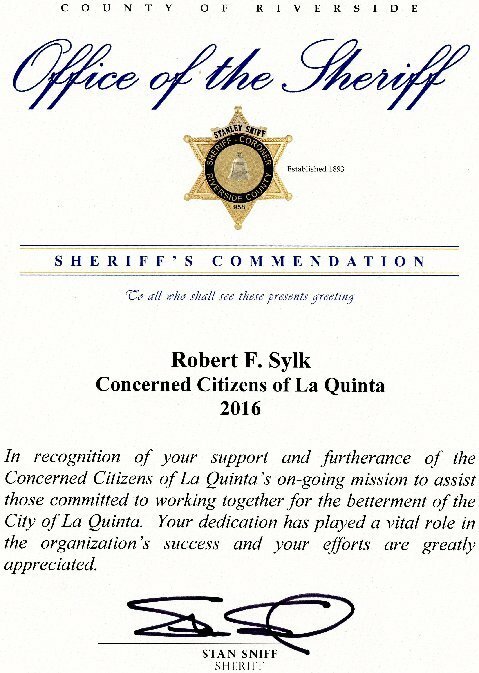 We are proud and honored today, June 21, 2016 to receive this "Award of Commendation" from The Riverside County Sheriff's Department signed by our friend Sheriff Stan Sniff. 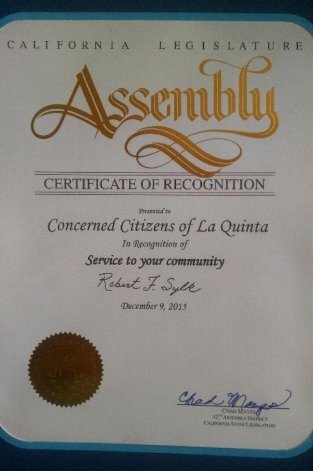 This United States Congressional Award presented to Robert F. Sylk and The Concerned Citizens Of La Quinta Organization last night this 5th day of May, 2016 by US Congressman Ruiz states "Honoring us for our commitment to the Citizens of La Quinta. 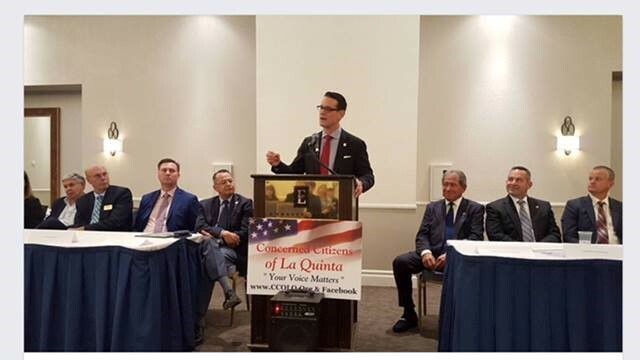 Thanking us for empowering our La Quinta residents to have a voice in city governance through our leadership and advocacy and wishes for us to continue to serve our community". 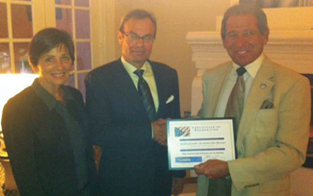 We are proud that our accomplishments are recognized from all areas of the Valley. 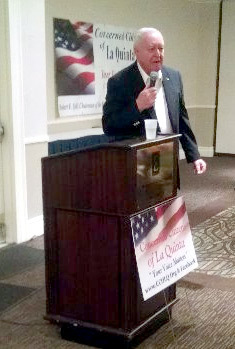 Riverside County Sheriff Stan Sniff's excellent presentation to our over 75 in attendance with the Q & A he was on for one hour. It was by far the best presentation we have ever witnessed with six (6) easels of information. I wish we could have filmed it for another time. We saw a passionate, dedicated, and professional public servant who knows his job inside and out, and is determined to achieve the best results possible for our public. 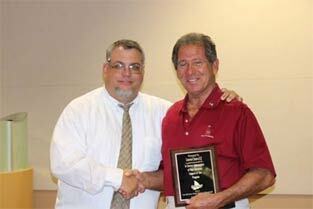 Sheriff Sniff receiving CCOLQ's highest Honor of Excellence from Chairman Sylk to enormous applause. 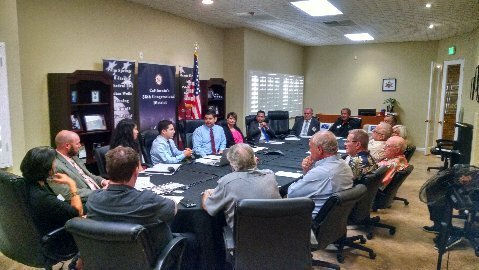 LQ Mayor Evans addressing meeting of 150 including seven (7) City Mayors - Don Adolph, Dana Hobert, Jim Ferguson, Jan Harnick, Glenn Miller, John Pena and State Senator Jeff Stone and Assemblyman Chad Mayes' District Director Greg Wallace. 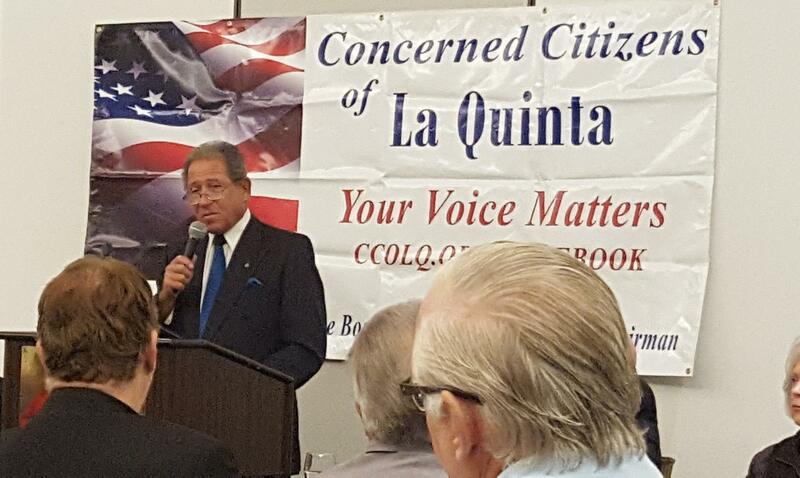 DA Mike Hestrin was terrific, John Pena and Frank Spevecek's presentation on the La Quinta City Report was right on target and The Vector Control Representatives were very informative. 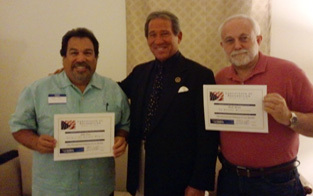 Mike Hestrin received the prestigious Re-Endorsement Award from Robert Sylk and CCOLQ to a standing ovation. CV Mosquito & Vector Control District Public Information Manager Jill Oviatt and Scientific Operations Manager Jeremy Wittie, MS with their Mosquito Trapping Device. 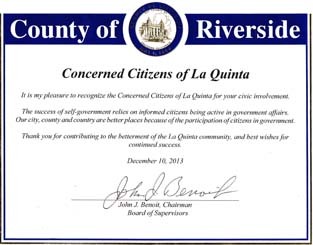 We are honored to receive The California State Assembly Award from Assemblyman Chad Mayes on December 9, 2015 with seven (7) City Mayors and 150 in attendance. 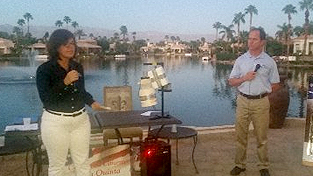 Gary Martin, President of the La Quinta High School Baseball Teams, presenting to Robert Sylk and The Concerned Citizens Of La Quinta their prestigious "2015 Award for Excellence" at the annual dinner on. 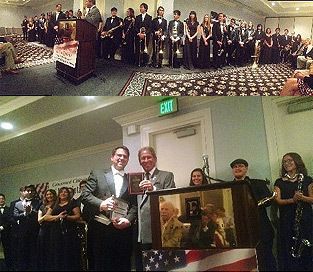 The La Quinta High School Wind Symphony Orchestra of 40 students who will perform at Carnegie Hall, New York City in March, 2015 honoring Chairman Robert Sylk & CCOLQ with 200 in attendance for helping to raise part of the $75,000 required for the 4 day trip. 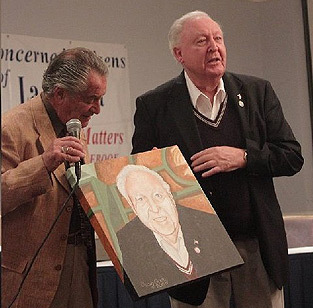 La Quinta Artist Craig Cary presenting to Don Adolph on January 21, 2015 his Portrait that we all signed personal notes on the back frame. 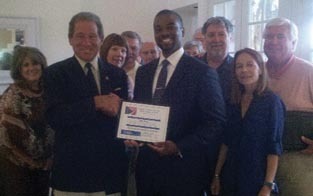 When Mayor Adolph was introduced the Symphony Orchestra played "Hail To The Chief" to rousing applause from the audience. 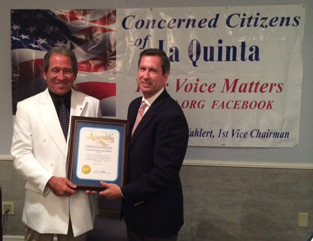 This was truly a night to remember for all of us as we honored Don's 23 years of accomplishments to La Quinta. 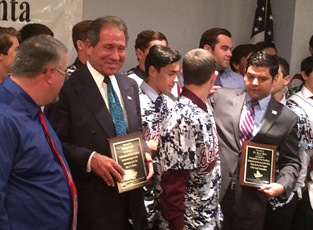 US Congressman Dr. Raul Ruiz and Chairman Robert Sylk accepting The La Quinta High School Baseball Team's Award for Excellent Service to the Community of La Quinta on October 8, 2014. 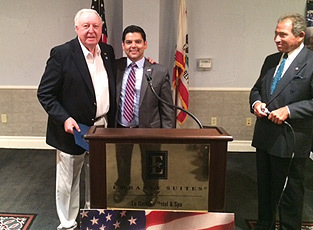 Mayor Of La Quinta Don Adolph welcoming our Congressman Dr. Ruiz to our City of La Quinta and CCOLQ on Oct. 14, 2014. 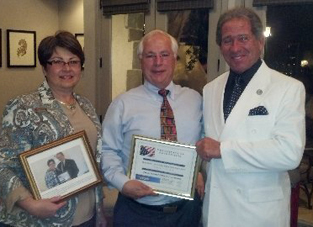 Chairman Sylk presenting to Bonnie Garcia, CA Senate Candidate, and US Congressional Candidate Brian Nestande, CCOLQ's Certificate of Excellence Award at The Embassy Suites in La Quinta September 16, 2014. 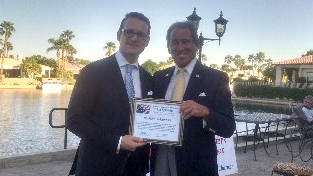 Robert Sylk accepting on September 16, 2014 from Assemblyman Brian Nestande the prestigious California State Award honoring our remarkable service to the community of La Quinta, CA. 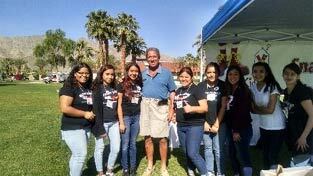 CCOLQ is the proud sponsor of the winning La Quinta Baseball Team 2014. 6' x 12' Banner on the left field wall at Varsity Stadium. 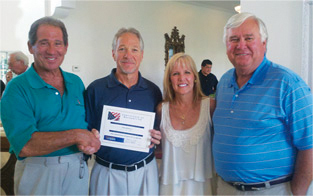 Mr. Gary Martin, President of the La Quinta Baseball Boosters presenting to Mr. Robert Sylk and the Concerned Citizens of La Quinta Organization their "Sincere Appreciation of Your Generous Support of Our Program" Award on May 21, 2014. 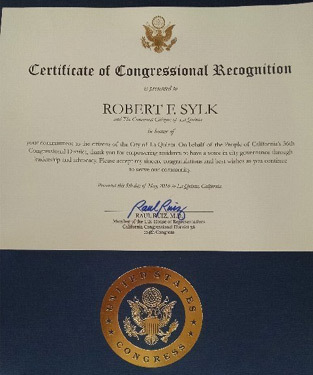 Sylk said "This award is a Grand Slam for us at CCOLQ and we look forward to a repeat in 2015"
Robert F. Sylk presenting to Assemblyman V. Manuel Perez and Coachella Mayor Eduardo Garcia CCOLQ's Certificate of Excellence on March 11, 2014 at The Chateau at Lake La Quinta. 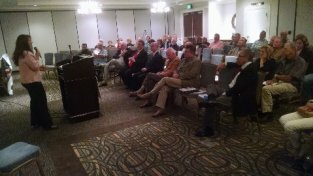 March meeting - Chairman Sylk's opening remarks to all in attendance. 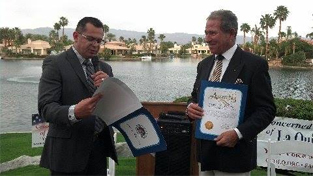 Assemblyman V. Manuel Perez presenting to Robert F. Sylk, CCOLQ Chairman of the Board, The California Legislature's "Exemplary Leadership and Significant Contributions Award" on March 11, 2014 for his distinguished service to the City of La Quinta, CA. 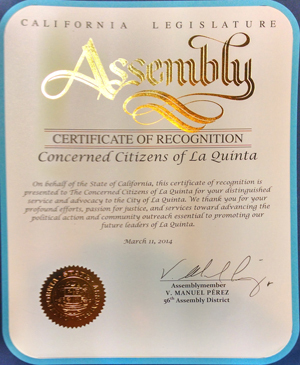 "Exemplary Leadership and Significant Contributions Award" presented Assembly V. Manuel Perez to CCOLQ. 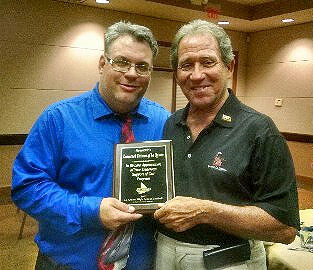 Robert F. Sylk presenting to John Patrick Dolan President/CEO Desert College Of Law CCOLQ's Award for Excellence. 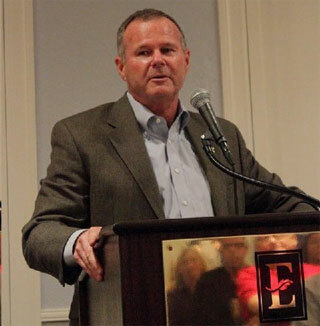 Mr Dolan will be our main guest speaker on February 11, 2014. 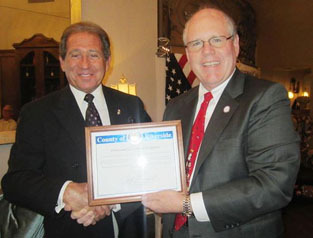 Robert Sylk with Riverside County District Attorney Mike Hestrin receiving CCOLQ's prestigious Official 2014 Endorsement. 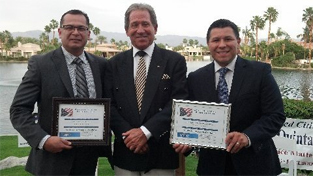 Chairman Robert Sylk proudly accepts for CCOLQ the County Award for Special Recognition from Riverside County Supervisor John Benoit — with Robert F. Sylk and John J. Benoit at The Chateau At Lake La Quinta. 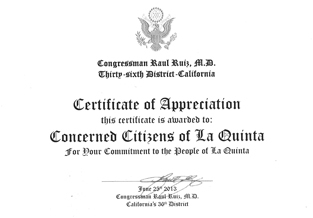 Certificate of Appreciation presented to the Concerned Citizens of La Quinta by Congressman Ruiz. 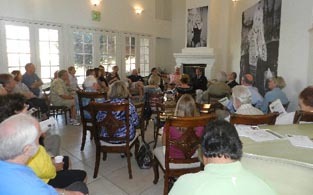 January 15, 2013 CCOLQ Issues Committee meeting to discuss current and future problems facing our City of La Quinta. 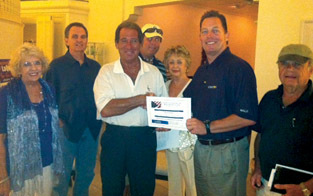 Fritz Bachli, Ed Ehrich, Len Wahlert, Phil Werber, Linda Gunnett, seated Dave Heckman. 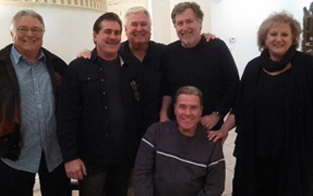 Photo taken by Chairman Sylk. 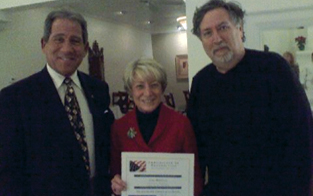 Robert F. Sylk, CCOLQ Chairman and Phil Werber, Treasurer and Chair Elect presenting to La Quinta City Councilwoman Linda Evans CCOLQ's Award for Excellence on December 11, 2012. 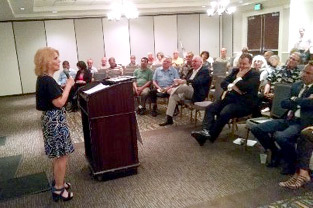 This spirited fast paced two (2) hour meeting with all geographical segments of La Quinta in attendance was respectfully conducted as one to remember because of the Councilwoman's patience and preciseness and extraordinary way she has in answering all questions posed. 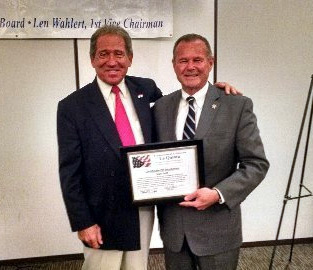 Picture taken by 1st Vice Chair Len Wahlert. 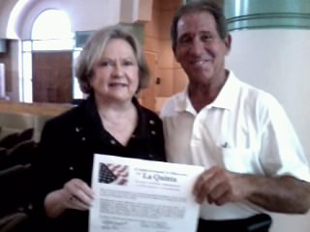 Robert Sylk presenting to Lee Osborne on behalf of The CCOLQ Membership our Official Letter of Endorsement for La Quinta City Council 2012. 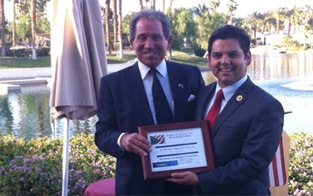 Witnessing this Citation and in attendance were The Executive Committee Of CCOLQ and guests including Barry Smith, past City Commissioner Howie Long, the past Mayor of LQ John Pena, the present Mayor of LQ Don Adolph, along with the LQ Chamber of Commerce Chair Mark Moran, Indio City Councilman Sam Torres, past Chair of Republican Party Bob Richmond, LQ Chief of Police Frank Taylor, and Guest Speaker Riverside County Sheriff Stanley Sniff. 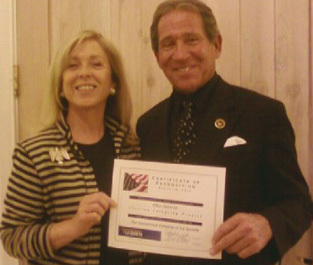 Robert Sylk presenting to Kristy Franklin on behalf of The 411 Members of The Concerned Citizens Of La Quinta our Official Letter of Endorsement for La Quinta City Council 2012. 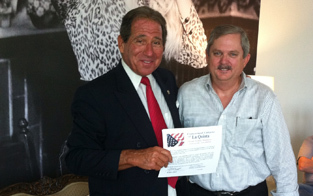 Robert Sylk CCOLQ Chairman and La Quinta Mayoral Candidate presenting Corky Reynaga-Emett with The Concerned Citizens Of La Quinta Endorsement for the 56th Assembly District 2012 at the East Valley Woman's Republican HQ's in Indio, CA. 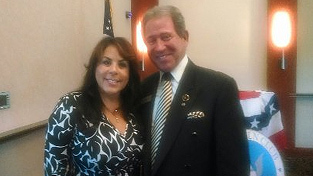 CCOLQ Chairman, Robert F. Sylk, and Riverside County Sheriff, Stanley Sniff. 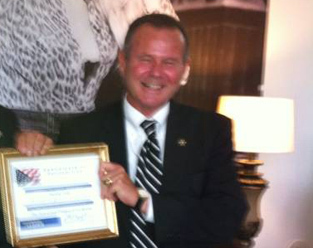 Presentation of CCOLQ Certificate of Appreciation. 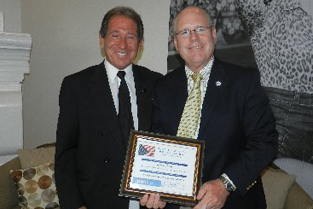 Chairman Robert Sylk presenting to John Henry, Riverside County Prosecutor and Superior Court Judge Candidate the prestigious CCOLQ Award for Outstanding Service. 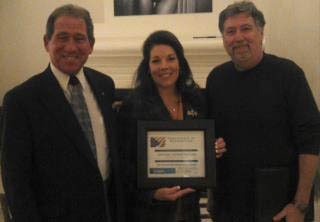 On Mr. Henry's left is CCOLQ's Treasurer Phil Werber and Event Chair Irene Werber and Executive Board Secretary Len Wahlert. 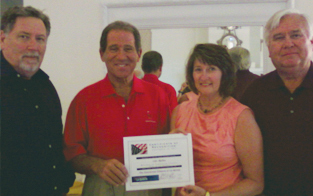 On Mr. Sylk's right is Deb Ehrich Secretary with husband Ed, Chairman of the CCOLQ Southeastern Communities Committee. 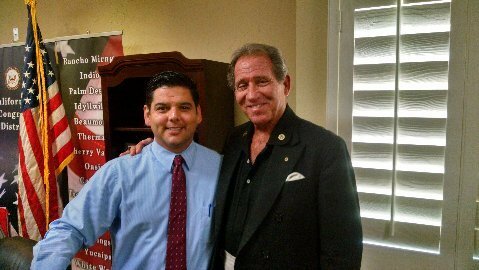 Mr. Henry in 45 minutes won all of us over with his professionalism and articulation of his knowledge of the legal system in Riverside County. He has our full support. 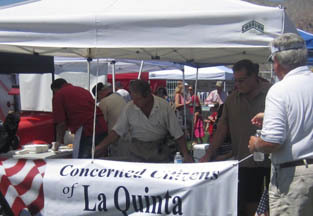 CCOLQ Founder, Robert Sylk, Ed Ehrich and Len Wahlert are busy at work helping the community of La Quinta. 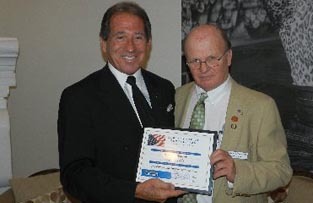 Superior Court Judge candidate Michael J. Kennedy receiving from Robert Sylk The CCOLQ Award of Recognition for a well received presentation on his platform. 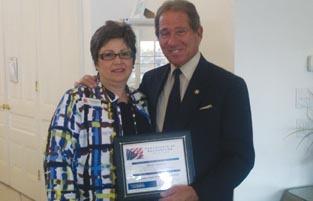 Ellen Swensen, Riverside County Chairman for the Election Integrity Project receiving CCOLQ's Chairman Robert Sylk the Award of Excellence for her presentation on election fraud on March 13, 2012. 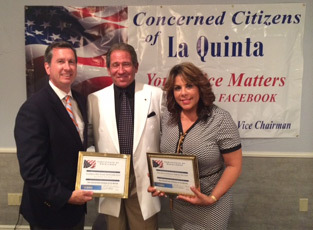 Robert F. Sylk, Chairman of The Concerned Citizens of La Quinta www.ccolq.org, with ccolq member Wilma Mills, presenting to Mr. Greg Burton, Executive Editor of The Desert Sun the prestigious CCOLQ award for excellence and recognition in his, and The Desert Sun's, devotion to issues of great importance to La Quinta and the East Valley. 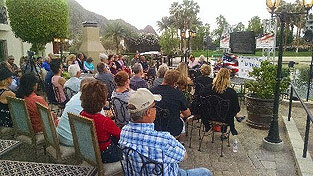 Mr. Burton's appearance on a rare rain filed evening in La Quinta inspired all of us, and especially Mr. Burton, who braved these last minute weather conditions to hear a truly remarkable man speak about his life and his insights for our future, and for that, and showing all of us his truly down to earth demeanor we applauded him with the utmost of respect. Thank you Mr. Burton, please stay in this lovely Valley. We need more like you! 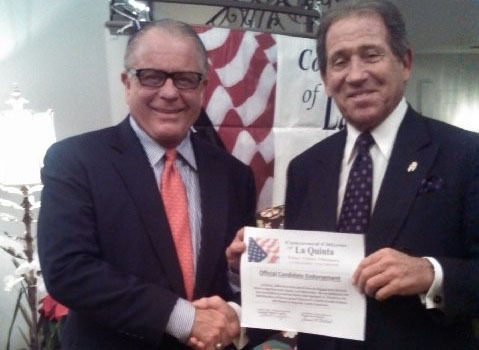 Robert F. Sylk, Chairman of the Concerned Citizens of La Quinta presenting Special Certificate of Recognition and Appreciation - to President/CEO David Archer of the La Quinta Chamber of Commerce for a well-received presentation and Q & A. David demonstrated the highest of integrity and respect in his answers and we thank him for his time and patience. 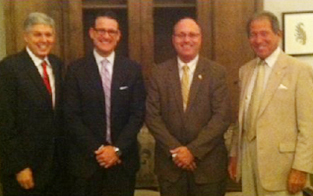 Other present in the picture from left to right: Wilma Mills, Barry Spence, Robert Sylk, Lance Dawson, Ann Kosich, David Archer, and E. J. Rummel. 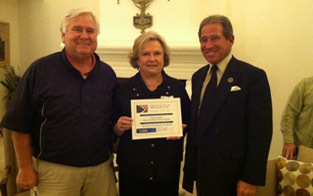 Robert F. Sylk, Chairman of The Concerned Citizens of La Quinta, along with Board Secretary Len Wahlert, and City Commissioner Andrea Spirtos, presenting to Mr. Tom Genovese, City Manager of The City of La Quinta, their special Certificate Of Recognition and Appreciation for a well received 1 1/2 hour speech and Q & A meeting. Mr. Genovese showed the highest of integrity and respect in his answers and we thank him for his time and unwavering patience.